- anti-glare mode: flick anti-glare switch 1 forwards or back. Exercise care when using the passenger-side exterior rear view mirror. The mirror surface is convex (outwardly curved surface for a wider field of view). Objects in mirror are closer than they appear. Check your interior rear view mirror and glance over your shoulder before changing lanes. 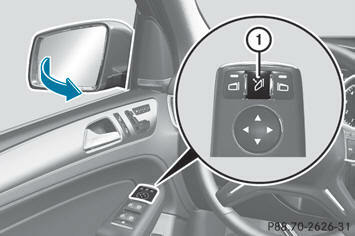 - Press button 1 for the left-hand exterior mirror or button 2 for the right-hand exterior mirror. - Press adjustment button 3 up, down, to the right or to the left until the exterior mirror is set to a position that provides you with a good overview of traffic conditions. - Briefly press button 1.
mirrors are always folded out fully while the vehicle is in motion, as they may otherwise vibrate. 30 mph (47 km/h), you can no longer fold in the exterior mirrors. If the battery has been disconnected or completely discharged, the exterior mirrors must be reset. The exterior mirrors will otherwise not fold in when you select the "Fold in mirrors when locking" function in the on-board computer. - Make sure that the SmartKey is in position 1 in the ignition lock. If the "Fold in mirrors when locking" function is activated in the on-board computer: - the exterior mirrors fold in automatically as soon as you lock the vehicle from the outside. - the exterior mirrors fold out again automatically as soon as you unlock the vehicle and then open the driver's or frontpassenger door. they have been folded in manually. If an exterior mirror has been pushed out of position, proceed as follows: - Vehicles without electrically folding exterior mirrors: move the exterior mirror into the correct position manually. - Vehicles with electrically folding exterior mirrors: press and hold the mirror-folding button until you hear the mirror engage in position. The mirror housing is engaged again and you can adjust the exterior mirrors as usual. The rear-view mirror and the exterior mirror on the driver's side automatically go into antiglare mode if the ignition is switched on and incident light from headlamps strikes the sensor in the rear-view mirror. The mirrors do not go into anti-glare mode if reverse gear is engaged or the interior lighting is switched on. - Make sure that the vehicle is stationary and that the SmartKey is in position 2 in the ignition lock. - Use adjustment button 3 to adjust the exterior mirror to a position that allows you to see the rear wheel and the curb. another position, the exterior mirror on the frontpassenger side returns to the driving position. position using memory button M 4. - With the exterior mirror on the frontpassenger side activated, use adjustment button 3 to adjust the exterior mirror to a position which allows you to see the rear wheel and the curb. - Press memory button M 4 and one of the arrows on adjustment button 3 within three seconds. If the mirror moves out of position, repeat the steps. 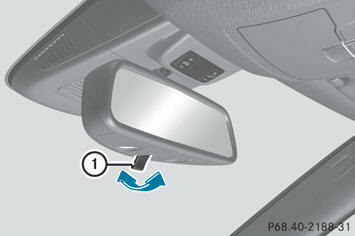 - Adjust the exterior mirror on the frontpassenger side with the corresponding button. The exterior mirror on the front-passenger side moves back to its original position: - as soon as you exceed a speed of 9 mph (15 km/h).